Baked beans are often being associated with breakfast food. 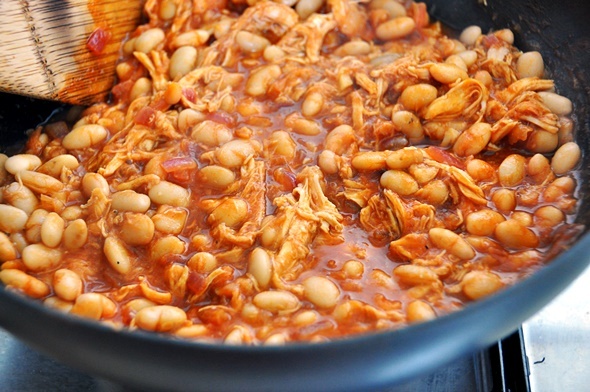 However, when I was growing up, baked beans were eaten for lunch or dinner, with rice. As I was not a fan of baked beans then, fried diced potatoes and sometimes, sliced sausages were added into the baked beans to make it more palatable for the picky younger self. I have come a long way since then, especially because my beloved really enjoys legumes dishes. Instead of resorting to ready-to-eat baked beans all the time, I find making baked beans using my pantry staples are just as easy. 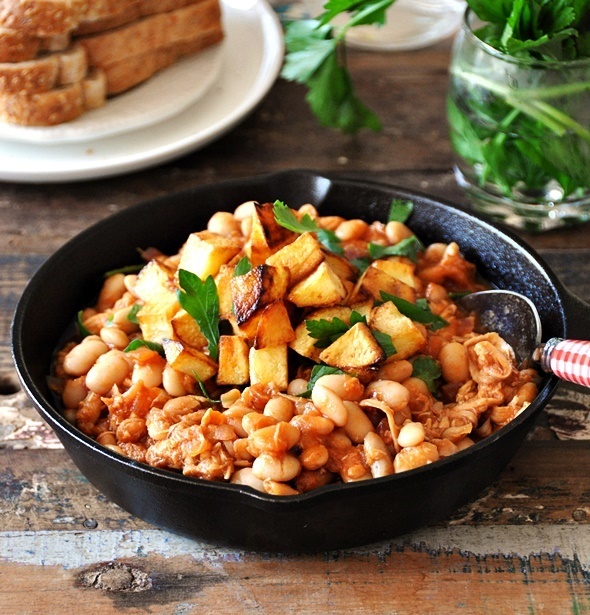 I have feature a maple syrup flavoured baked beans recipe some time ago. 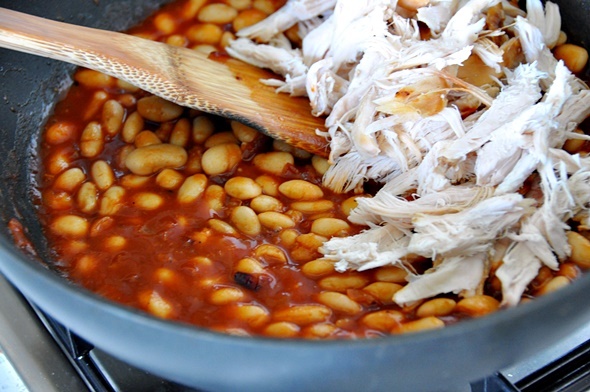 As there is no hard and fast rules on how baked beans should be made, I have came up with another baked bean recipe with some modifications including adding my favourite Sweet Baby Ray’s Barbecue Sauce (obsessed with the hickory smoked flavour! ), shredded roast chicken (another way using up your leftover) and pan fried potato nuggets, a nod to my childhood. Potato croutons: Make sure you remove any moisture from the diced potato with a paper towel. 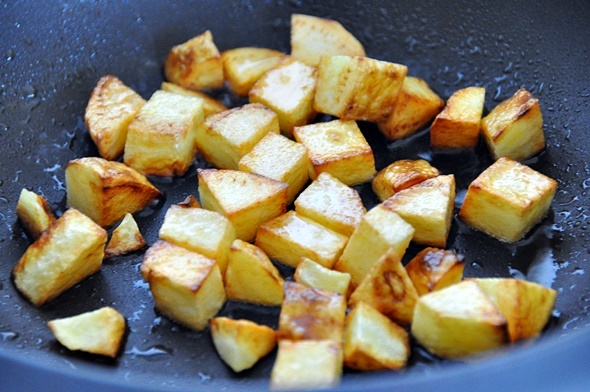 Pan fry the diced potato in hot oil until golden brown over medium heat. Set aside on paper towel lined plate to remove the excess oil. In the same pan, saute onion and garlic until aromatic. 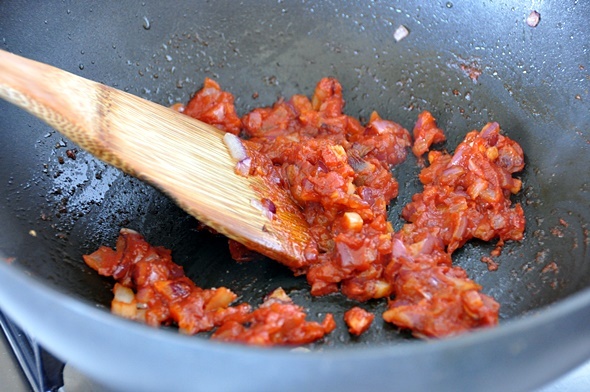 Add tomato paste and saute for a minute. Add beans, barbecue sauce and water. Mix until well combined. Cook the mixture until reaching boiling point, covered. Add shredded chicken, stir to combine. Check for taste. Add soy sauce and kecap manis to taste. The kecap manis is to darken the mixture so you can skip this ingredient if you don't any on hand. 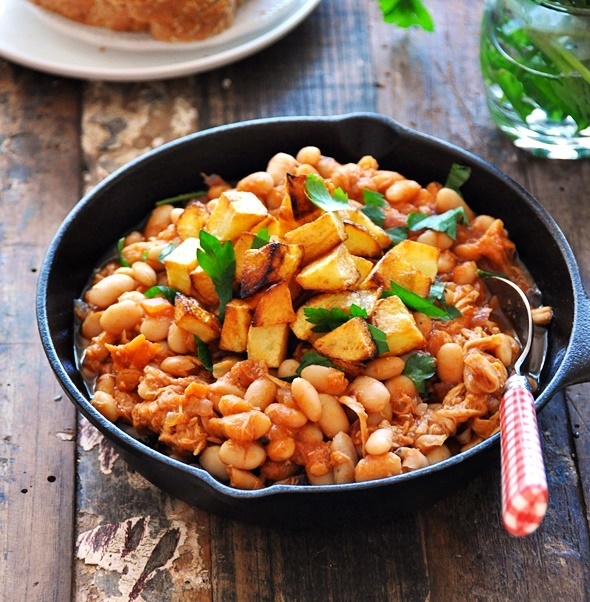 Transfer the baked beans to a bowl and garnish with the potato croutons and chopped parsley. Sign up here for free recipes delivered straight to your inbox!